Biaung Beach is a charming black sand beach. This beach has a beautiful coastal panorama, wide sea views, peaceful surroundings, and a direct view of Padang Galak, Sanur, and Nusa Penida Island. 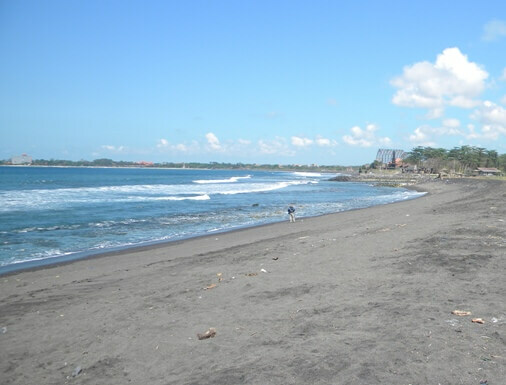 The beach is situated in Kesiman Village, East Denpasar District, Denpasar City, Bali. The beach is easily reached by car and motor bike and just 45 minutes (in normal traffic) from Ngurah Rai International Road. Biaung beach is located on the south side of the Prof. Dr. Ida Bagus Mantra road, just before Lembeng Beach. The strategic beach location makes it easy for visitors to access several tourist attractions located in Sanur area, Sukawati, around Denpasar, and even East Bali. There are several food-stalls (warung) that provide snack and soft drink for visitors. It’s also supported with adequate vehicle parking. However, there are issues related to the accumulation of waste in the form of wood and plastic during the rainy season. The related parties continue to work on this issue and maintain the security and comfort of visitors at Biaung Beach. You will be amazed by the breathtaking panorama and tranquil environment. Visitors come here to enjoy the laid back and calm atmosphere, walk down the sandy path, fishing, and even fly kites. This Beach is not recommended for swimming, due to the big waves and no beach guard. The beach is really hot during the day, but cool in the morning and afternoon. Biaung beach is also endowed with a beautiful sunset, peaceful and romantic. 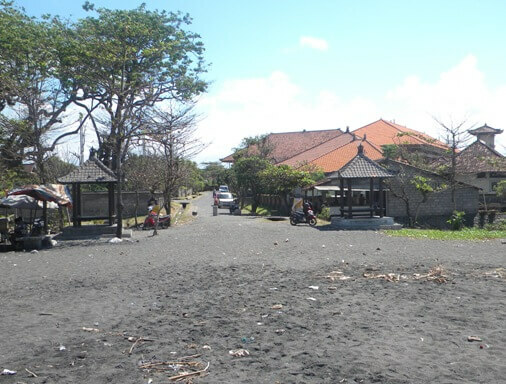 This beach is used as a ritual site for Balinese Hindus such as for Melasti Ceremony and Purification Ceremony. There are also beautiful temples on the western tip, Pura Campuhan Windhu Segara and Pura Dalem Segara Taman Ayung, both have notable Balinese architectural. This beach has big and powerful waves, and as well as one of the best surfing spot in Bali. This spot offers great swell quality and right-hander. It's recommended for intermediate up to professional surfers. 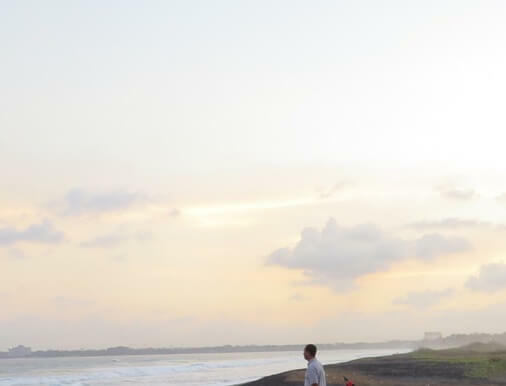 From this spot, surfers can access some other surfing spots such as Keramas, Ketewel, Padang Galak, and Sanur.